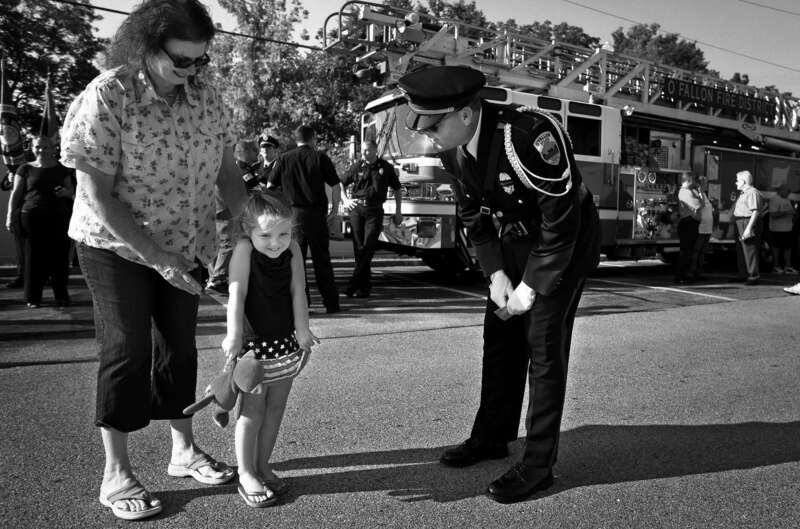 Jeanne Tallman escorts her granddaughter Whitney Weeks, 3, as she hands a coloring she did to O'Fallon police officer Mike Plum after a ceremony honoring first responders in O'Fallon, Mo. on Wednesday, Sept. 11, 2013. "She wanted him (Plum) to know she was thinking about them" said Tallman who said the coloring paid tribute to the fire fighters and police officers who gave their lives on September 11. The City of O'Fallon, Mo. hosted a Patriot Day Ceremony, a Tribute to First Responders by a piece of the twisted steel from the World Trade Center at the Municipal Centre.